I have a few questions that I need to clear up in order to help me understand better about derma stamping before I actually begin. I’m an Asian male, 19 years of age and have very pale/ white/ yellow skin colour as my normal skin tone. I want to give a quick description about my skin first. I’m going to be using the stamp on my face for very shallow acne scarring and a bit of hyperpigmentation. The areas that have the minor acne scars are the areas right next to the nose on both sides, which is also, for some reason, the only areas including my nose that gets oily during the day. It doesn’t get very oily where you can see a shine but is oilier then other parts on my face which practically have no oil. These 2 areas are where I had the most acne when I had acne which makes sense since these area’s produces more oil. It also sort of have, I’m not 100% sure, noticeable pores. I’m confused whether these noticeable pores were due to acne and are now shallow scars or are they natural due to genetics and because the skin is oily. I know that oil accumulation can make pores appear ‘larger’ since after a shower, the pores are less noticeable. 2)Should I be stamping dry? As in, do I need to put on any oils/creams to first moisturize the skin before stamping? 3) Do the use of topicals before and after the stamping play a big role in actually inducing collagen? Like say if I only use the stamp, 60% of collagen will be induced but if I use a topical, 80% will be induced. Is this true? Or is the end result all the same whether I use a topical to encourage collagen (Vitamin C) or just stamping and moisturizing? 4) If someone had seen improvements in reducing their pore size, is there a point where the pore will stop getting “smaller”? Or will it keep going until it becomes officially unnoticeable? I’m asking this because I feel as though my pores are already quite smaller, and even after I stamp, they won’t “shrink” any further. 5) Since I have tiny isolated noticeable pores, if I penetrate a pore, like if the needle goes directly into a pore, will it stretch it? This is just a visual fear that I had thought about and I know that there are many needles surrounding each needle and that this would make more sense if it was a single needle. This is the only possibility that I see that a pore can get “bigger”/ worse. If there are other factors that a pore can get larger, please let me know. 6) Is there any possibility that my derma stamp can give me hyperpigmentation? What is the difference between a white head giving me hyperpigmentation then a derma stamp? 7) Is it OK to moisturize right after I derma stamp? Can I use oils such as coconut oil, olive oil, or almond oil? Which one would be better with the less chance of encouraging any breakouts as I have never used oils but I want to for my derma stamping. 8 ) My skin has decreased a lot in terms of being red since my acne days (acne subsided about a year ago) but it still is a little bit pink. Once I derma stamp, I know that my skin will get really red and somewhat swollen but since right now it is still a little bit pink, will making it more red with stamping encourage my skin to remain somewhat pink for ever? Those are the questions I have, hope it isn’t too much! Once I begin derma stamping I plan on eating more vegetables, fruits, and protein, not that I don’t now. I also am planning to get a lot of sleep every night and stay indoors for about a week. All in all, my biggest fear would be if the pores get bigger and “stretch out” more rather then becoming smaller. I have purchased the 0.5mm derma stamp as I heard it is the shortest needle length that can induce collagen and also since I have shallow and isolated and minor scarring with a few hyperpigmention. I think it’s best to start out small to see how my skin reacts first. 1. Do I need to stamp dry? Like could I possibly moisturize the skin with an oil and then stamp? Or would there be no difference if I moisturize immediately after I stamp? 2. Should I exfoliate my skin before I stamp? 3. Once I rolled/ stamped and collagen reforms. Is that collagen only temporary like once I get old will that collagen that I had reformed ‘leave’ quicker then the collagen in areas that have never been damaged and needed rebuilding? 4. If a needle goes directly into a pore duct (which will highly happen) will it stretch the pore? I know this would probably apply to if it was only 1 needle instead of many needles packed together but would this still happen? These are the questions I have. >1. Do I need to stamp dry? Like could I possibly moisturize the skin with an oil and then stamp? Or would there be no difference if I moisturize immediately after I stamp? Applying a cream/oil prior to dermaneedling is not necessary and it will make the needles greasy but you can do it if you prefer it. You should keep the skin moisturized after microneedling. >2. Should I exfoliate my skin before I stamp? Yes. I highly recommend you our 0.5% Tretinoin cream. It will keep acne under control, reduce oiliness and diminish hyperpigmentation. >3. Once I rolled/ stamped and collagen reforms. Is that collagen only temporary like once I get old will that collagen that I had reformed ‘leave’ quicker then the collagen in areas that have never been damaged and needed rebuilding? The collagen will stay long, but not forever. >4. If a needle goes directly into a pore duct (which will highly happen) will it stretch the pore? I know this would probably apply to if it was only 1 needle instead of many needles packed together but would this still happen? We have sold dermaneedling tools to more than ten thousand customers. A few managed to shrink their pores through dermaneedling, in the majority of customers the pores were unaffected and three customers reported that it appeared that their pore size increased. One of the three reported that his acne scars improved but the pores seemed larger. The other of the three reported that her pores got bigger but that they went back to normal after a couple of months. The only way to find out how your skin will react is to do a small test patch. Thank you for answering Sarah. I do plan on doing a test patch, but should I do it on my face or is there somewhere on my arm, like the inner arm or something, that the skin there would resemble the skin on the face that I can do a quick test patch on? Also to my 3rd question, what I meant was that, will the collagen that has reformed/ induced "leave" at a quicker rate then normal/ undamaged collagen as I get older? Like once the shallow indents have filled in, will the shallow indents eventually show up again as I get older? Or will the skin remain flat and that I will lose collagen all over naturally? This is probably the final question that I have: Which Oil Is The Best For Moisturizing The Skin? I was debating between Olive Oil, Coconut Oil, and Almond Oil. Which one would be the best in moisturizing the skin and with the less chance of clogging pores and causing breakouts? I was leaning more towards Coconut Oil since I read that it has anti fungal and bacterial properties. Will I go wrong if I choose either one of these oils? Test it first on your arm to see how your skin reacts in general (how long it stays red etc.) and then test it on your face. 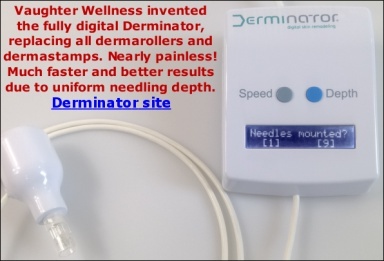 Dermarolling is a relatively new method. Nobody was microneedling 20 years ago so it is not possible to say with certainty how long the results will last. Scars that improved five years ago with microneedling are still improved today but there are individual variations, just like there are results variations with other methods. Also, wrinkles or lines that are directly related to facial mimics (such as the crow's feet) will reform quicker as the mimics will continue to (re)form them. Dermaneedling cannot stop aging. I tend to recommend almond oil but you can use any of your oils. For the face, olive oil and coconut oil may be too heavy.